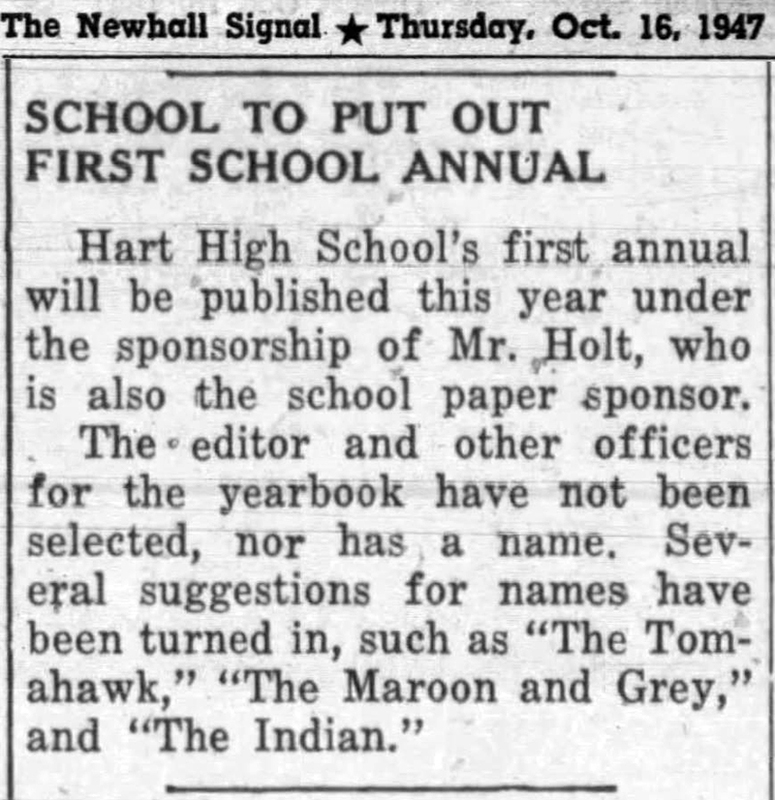 SCVHistory.com SH4801 | 1948 Hart High School 'Tomahawk' Yearbook. The first yearbook of the Santa Clarita Valley's first high school wasn't published in the year the first class graduated. Rather, it was published one year earlier, when the members of the Class of 1949 — the famous '49ers — were juniors. At the time, "William S. Hart Union High School" housed 9th, 10th and 11th graders. The 7th and 8th (and obviously the 12th) grades were added in the 1948-49 school year. It's hard to imagine today, but — while there might have been crosstown rivalries, there were no crosstown high school sports rivalries in 1948. Hart was no more (and no less) Newhall's high school than it was Mint Canyon's. Whether they hailed from Newhall, Saugus, Honby, Castaic or today's communities of Valencia, Stevenson Ranch or Canyon Country, everyone fought for the same team and called Hart "home." This particular yearbook belonged to Philip Hoskins who, alongside his twin brother Paul Hoskins, was a member of the Class of 1949. It was donated to the Santa Clarita Valley Historical Society in April 2017 by Phil's son Scott Hoskins, Hart Class of 1977. The book is softcover, black and white (except for the cover), bound together by four brass brads. If any of the words look blurry, try running your mouse over them. For the highest resolution, open the original .pdf and be patient. SH4801: pdf of original yearbook donated by Scott Hoskins, SCV Historical Society collection.